Update: If you missed the first class or want to see the slideshow again, it is up on YouTube at this link. Time: 6 pm – 8 pm. Dates: Three Thursdays – May 26, June 9, and June 16, 2016. Cost: Free to members. If you are not a member please bring $20 to the first class so that you can become a member. 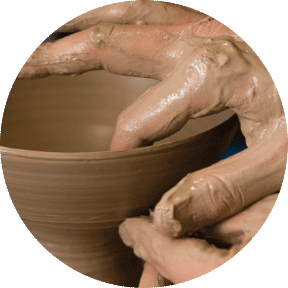 Do you want to learn more about glazes? Do you mix your own glazes? Do you buy some or all of your glazes but want to start mixing your own? Have you, like me, mixed countless recipes from books, articles, and websites only to find that the pots you made with the glaze looks nothing like the photos of the glaze you saw? Do you have a favorite glaze that is finicky and you want to learn how to make it behave? Knowledge is power! The basics are pretty simple to master. And, they are coming to a glaze class right here in Bend, Oregon, very soon! Join us for three Thursday night classes which will touch on glaze components, food safety, how to safely mix glazes, and basic glaze adjustments that can be made to cure glaze problems such as crazing. And a whole lot more. We will also be touching on a wee bit of glaze chemistry, however we will delve more into the chemistry in a future glaze class series, planned for later this summer. About the teacher: Owen Dearing is the owner/potter at Mug Revolution. For the past six years he has been working very hard on expanding his knowledge and understanding of clay and glazes. His enthusiasm for glazes will hopefully help you overcome any obstacles you have encountered in getting more control in your studio. Who will benefit? This mini course is open to any experience level. So if you are new to ceramics or you are an old pro, come on out. This class series applies to any firing temperature/atmosphere. Oh! That comment above about hecklers was a joke!! !